Below are the Top 5 items from the month of October. The month of October began with positive news for Endicott and the entire county. On October 4th, I joined the Governor as he announced a major economic boost for the Village of Endicott. Imperium3NY, a consortium of three Southern Tier companies, plans to invest $130 million to produce lithium ion batteries; the technology developed by these companies will enable the consortium to make a more efficient and less expensive product. We’ve worked very hard to grow and attract this type of business; our community has a tradition of innovation, and this new high-tech manufacturing company builds on that legacy. To read more about this exciting development, click here. 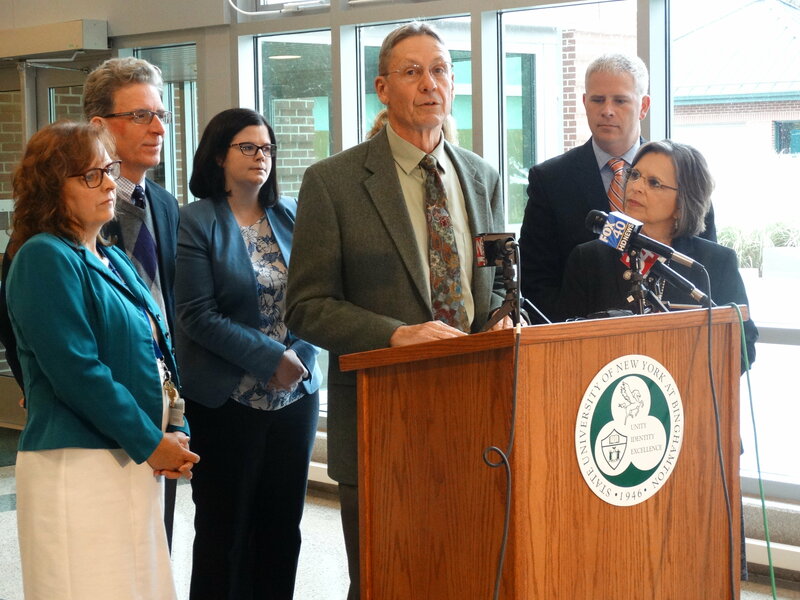 On October 23rd, I joined Rural Health Network of South Central NY (RHNCNY) to announce details of a $100,000 grant I was able to secure from the State Office of Alcoholism and Substance Abuse Services. RHNCNY is taking an innovative approach to this crisis by engaging AmeriCorps members and volunteers in prevention, treatment, and recovery efforts. These individuals will provide much needed support to three local agencies and many others in the region. Increasing treatment options has been another hurdle to helping those affected by local substance abuse. On October 13th, I joined County Executive Jason Garnar and Senator Fred Akshar as the County announced that Syracuse Behavioral Healthcare (SBH) was selected to provide treatment services at the former Broome Developmental Center. SBH will certainly help fill that gap and will be an important partner in our efforts to address this epidemic. I also co-hosted a public forum on the future of BDC with Senator Akshar and Assemblyman Cliff Crouch on October 26th to help answer any questions the public may have. The County Legislature now has to accept the state funds in order for the center to open early next year. Assemblywoman Lupardo joins Rural Health Network of South Central New York Executive Director Jack Salo, County Executive Jason Garnar, and community organizations to announce details of RHNCNY’s AmeriCorps program. On October 16th, I was honored to receive the Sen. William T. Smith Award with Sen. Fred Akshar from the NYS STOP-DWI Association. Sen. Akshar and I were recognized for our work to secure $1.6 million in the state budget to support STOP-DWI programs across the state and for a bill we passed that restructures how fines and fees on DWI offenses are collected. Fines for such offenses go to STOP-DWI programs in each county of the state; however, they are currently the last monies from offenses to be collected and often go unpaid. The bill we passed would require these fines to be collected first. This bill is awaiting action by the Governor. The true champions of the state’s STOP-DWI programs are the women and men who work every day to ensure that our roads are safe from impaired drivers. 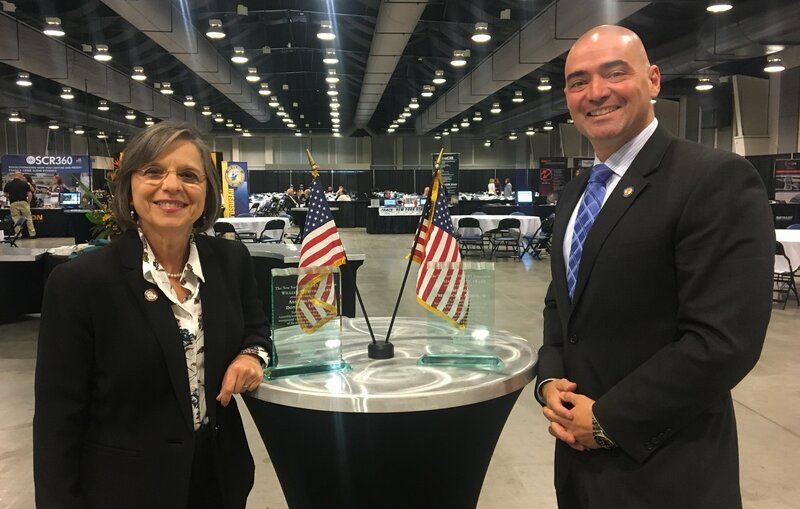 Assemblywoman Lupardo & Senator Akshar receive the William T. Smith Award from the NYS STOP-DWI Association. Afterschool programs have been a priority of mine for the last five years. On October 6th, I visited the Binghamton City School District to announce the expansion of out-of-classroom programs. BCSD received a $2.9M grant, spread out over five years, from the Empire State Afterschool Program which will benefit 400 district students in grades 2-12. Studies have shown that children who participate in after-school programming have higher attendance rates, get better grades, are less likely to get into trouble, and are better prepared for college and the workforce. These efforts also play a major role in our ongoing work to curb poverty in the community as education directly corresponds with finding and maintaining employment. Click here to read more. Over the last 12 months the Broome-Tioga Suffrage Anniversary Committee has organized a number of events to share the stories of the women – and men – that helped New York women win the right to vote in 1917. 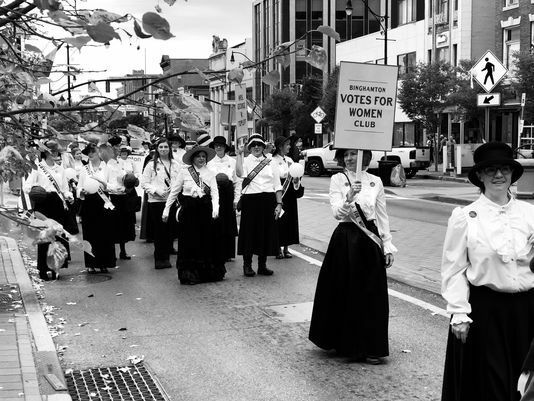 On October 7th, we hosted our signature Broome County event, a re-creation of the historic 1913 NYS Woman Suffrage Association Convention and parade. More than 200 people dressed in period-era attire marched down Main and Court Streets to the historic Landmark Church, site of the 1913 convention. Inside the church, we recreated a portion of the convention proceedings and several speakers reenacted the roles of notable Broome County suffrage supporters. This was an amazing and inspiring event that truly brought history to life. You can read more about the event here and see additional photos of the parade and convention here. Assemblywoman Lupardo and local women portray the Binghamton Votes for Women Club during the 1913 Suffrage Parade in Binghamton.